New Delhi - South Korean automotive manufacturer, Hyundai, seems to be more daring to kick off the four-wheeled market. After removing a tough and high-tech car, this time Hyundai will present a cheap yet sophisticated car that starts from US$. 5000. 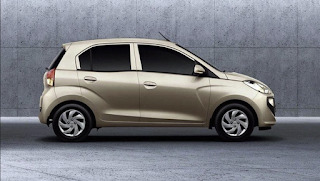 Rushlane reported, Hyundai calls this new weapon Santro and is scheduled to launch on October 23 2018. It is suspected that the car will be first presented in India and may be going to Indonesia. In India, Santro said, it would be priced around 370 thousand rupees, equivalent to US$. 5000. Quite interesting considering that cheap cars (LCGC) made in Japan in Indonesia alone have now entered above US$. 6700. From the photos Rushlane obtained, there were not enough curves to enjoy. But with 14-inch iron rims without alloy options, Santro is enough to become an entry level car and everyday friend. Various advanced technologies also do not forget Hyundai pinned on this 5-passenger hatchback, such as the touchscreen entertainment system, rear AC, AMT Transmission smart auto, the engine claimed to be more efficient, up to its safety features (dual front airbags, ABS, EBD, seatbelt reminder, speed warning system, and parking camera). Under the hood, Santro is equipped with 1,100 cc engine that can release power up to 69 horsepower and 99 Newton meters. Power is channeled to the front wheels through a manual transmission or five-speed automatic. 0 Response to "Wow! Hyundai Will Release Very Cheap Cars"